Look no further for a free printable May calendar! 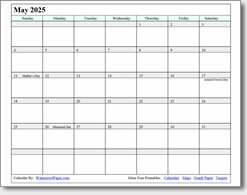 We offer monthly calendars as .pdf files that can be downloaded and printed on almost any computer with a printer and Adobe Reader. Our calendars fit standard 8 ½ x 11 inch sheets of paper for your convenience. For easy reference we included the most commonly recognized May holidays: Mother's Day (be sure to call if you can't visit), Armed Forces Day (respected in many countries), and Memorial Day.